I’ve mentioned before that I’m gaining weight and I promised myself that I need to do something about it. Maybe I should check my eating habits and consider having a healthy diet, I don’t really eat that much but I must admit that my eating habit is not healthy. I’m a full-fledged meat eater and not a fan of vegetables so diet is not really for me. It is already the second quarter of the year and still no changes; you can call my diet “bukas na diet” because I keep on postponing it. Every time I read something about healthy living, I always remind myself that I will do it but as expected nothing happened so when I got an invite to attend “Healthier Moms, Happier Kids” event, I did not think twice. Good thing it was a weekend event and my husband was willing to accompany me. So last Saturday, off we went to Makati. I’m glad that I attended this event, listening to Dyan Castillejo and Matthew Castillejo makes me cringe because I’m totally opposite of them. A nine-year-old boy has 85% healthy eating habits and 15% only for non-healthful foods so at least he can taste soda and processed foods like bacon, hotdog or any stuff that other kids enjoy. I admired their lifestyle; they are very active, fit and healthy. How I wish when I reach my 40’s I will be like her. Dyan Castillejo is already 45 years old and she feels like 25 years old. OMG, I’m 29 years old but I feel so old because I can no longer do the things that I used to do when I was still in my teenage years. There are more inspiring stories I want to share with you but I don’t want to bore you. But Dyan Castillejo’s lifestyle gives me more reasons to remind myself that I need to start my healthy living. I asked Dyan Castillejo, how many glass of wheatgrass does she drinks every day and if there’s any side effect. She said, she drinks 10 glasses of wheatgrass and side effect is glowing skin and healthy body. Her son started drinking wheatgrass 4 years ago, so Matthew was five years old that time and he drinks 2 glasses a day. 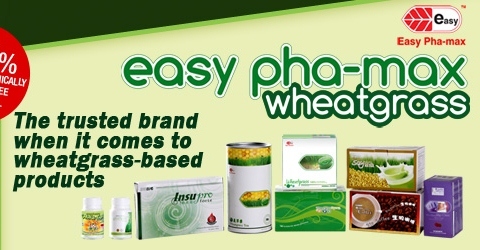 After the talk, they introduced to us the Easy pha-max wheatgrass products. There is a juice dispenser where you can enjoy wheatgrasshoney. I was hesitant at first to try the drink, I’m not fond of green foods or green drinks, I don’t even like the taste of Green Tea Frappe but surprisingly, we love the taste of wheatgrasshoney and it is not a joke. 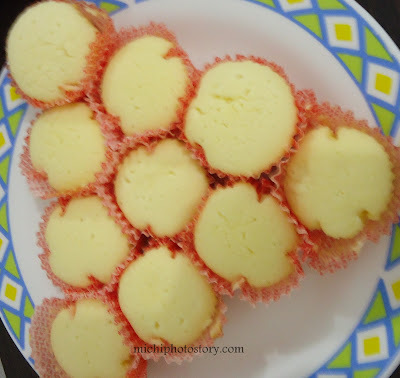 They give wheatgrass polvoron to all the kids and my son loves it too, he ate 2 pieces of polvoron. Easy Pha-max Wheatgrass cleanses, alkalizes and nourishes your blood and body with just one sachet a day to give you the maximum benefits of this wonder food. 1. It has the highest chlorophyll content among other greens. It detoxifies the blood, promotes blood production, prevents anemia and assists in wound healing. 2. It is a great source of fiber that promotes regular bowel movement and prevents constipation. 3. It is loaded with antioxidants that neutralize free radicals and fight aging. 4. Enzymes in wheatgrass help the liver in breaking down harmful substances in the body and bloodstream. 5. It neutralizes acids in the body pH that prevents bone problems, blood disorders and promotes healthy cell growth. 6. It promotes healthy blood circulation and better blood circulation. 7. It is a superfood with 13 vitamins, 10 minerals, 17 amino acids, chlorophyll and fiber which the body needs to function efficiently. 8. Rich in abscisic acid and enzyme called P4D1 that help prevent the formation and growth of cancer. 9. Aid in digestion and faster metabolism. 10. It promotes better body functions, muscle growth, and energy. 11. It stimulates growth hormone production, aids in male fertility and relaxes muscles in blood vessels, allowing better blood flow and preventing high blood pressure. Since 2009 I’ve been using organic products, I even registered to become a member of Greencow to avail discounts and until now I’m still using these products especially the insect repellent lotion. I always bring this lotion everywhere we go just be sure that we are safe from dengue. Last year, I had a chance to visit Ilog Maria Honeybee Farm and I’ve tried these products. 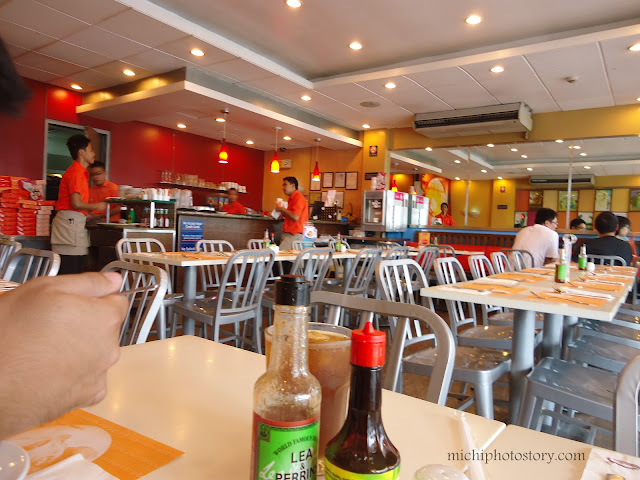 Compared to Greencow, Ilog Maria is more affordable. I love their massage oil and lip balm. I’ve received Human Heart Nature products 3 years ago; it was a gift from a friend. Then last December my son received HHN products and he is still using the HHN shampoo and baby wash. I was so glad when I won two giveaways because I have new stock of HHN products. =) I love the anti-bacterial pocket soap and sanitizer. How about you? What organic products are you using? 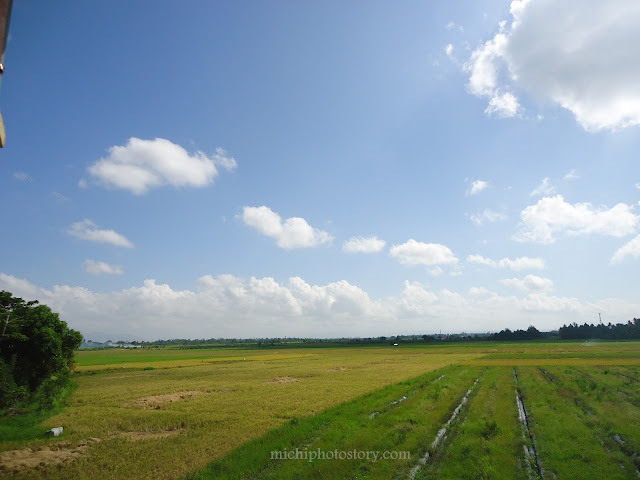 Last Saturday we went to Plaridel, Bulacan to attend my cousin’s wedding; we left the house at 12NN. 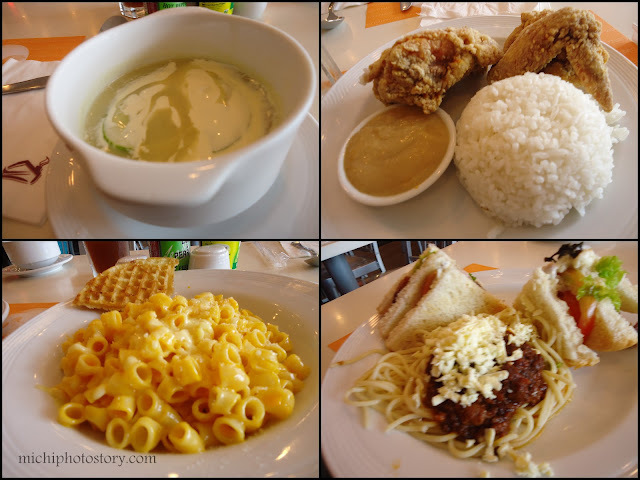 We stopped in NLEX gas station to have a quick meal at Pancake House around 3PM just to make sure that we won’t be hungry, nadala na kasi ko last week. 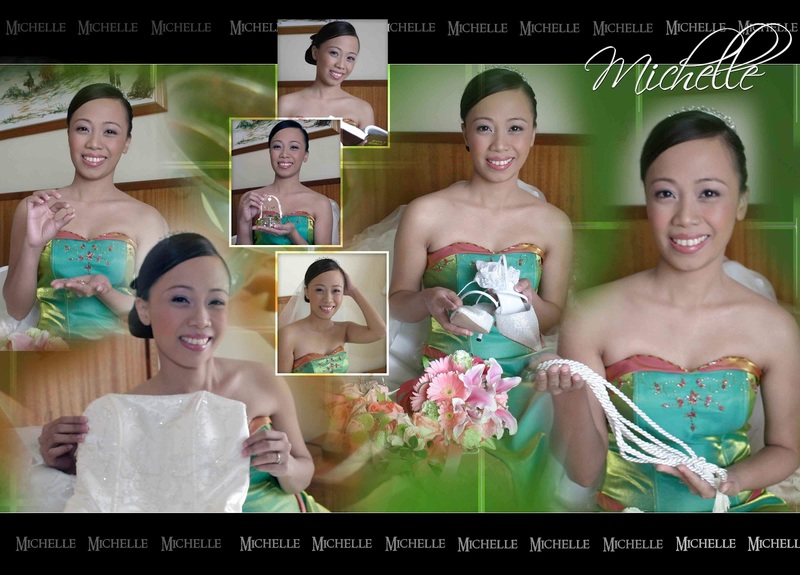 But it was a wrong decision, buzzer beater kami sa wedding (4PM), everybody was ready, anak ko na lang kulang. 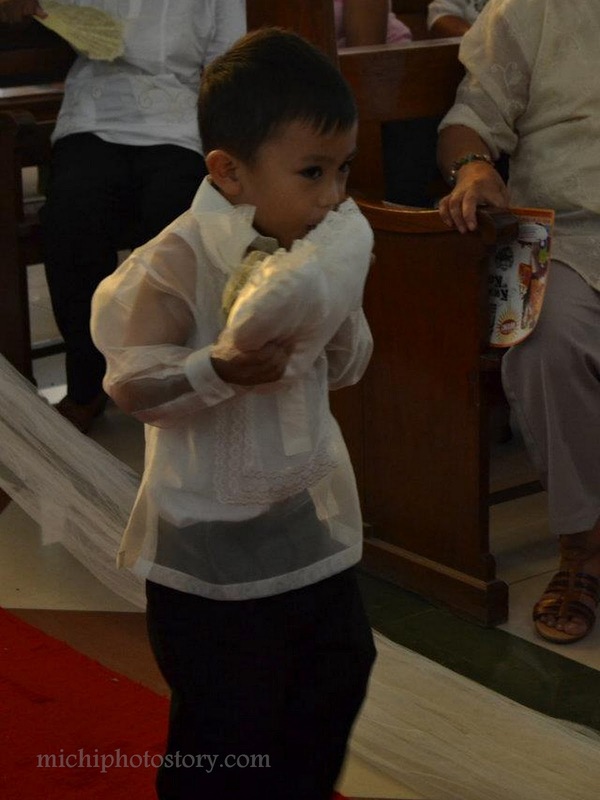 And I forgot his yellow shirt, mukhang others ang aking anak, (blame it to me #makakalimutin). Lesson learned, there are still people who follow invitation time. If you’re looking for a great value trip to Florida for the ultimate family holiday, you can find a great range of low-cost packages and cheap USA holidays to suit even the tightest of budgets at a price that won’t break the bank. 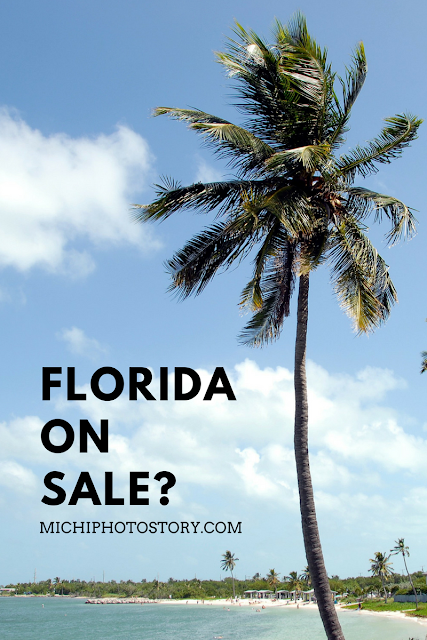 You might not find a trip to the States at Spain holiday prices - let’s face it, if you did you should be asking some serious questions about your tour operator - but with a bit of planning you can still enjoy cheap holidays to Florida complete with all the trimmings and with a good standard of accommodation. Like supermarkets, major tour operators are always competing against each other to win your custom which means they regularly discount the cost of holidays to draw you in. 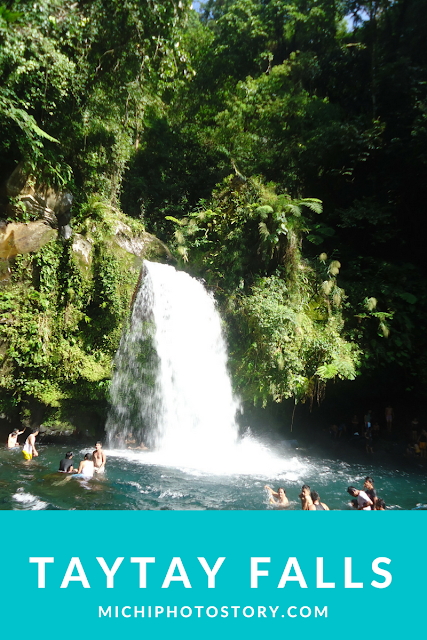 This is great news if you’re searching for low-cost holidays - especially if you’re traveling with children during the school holidays as this is often during peak season. If that’s not enough, when considering a long-haul destination like Florida it’s usually worth booking well in advance. 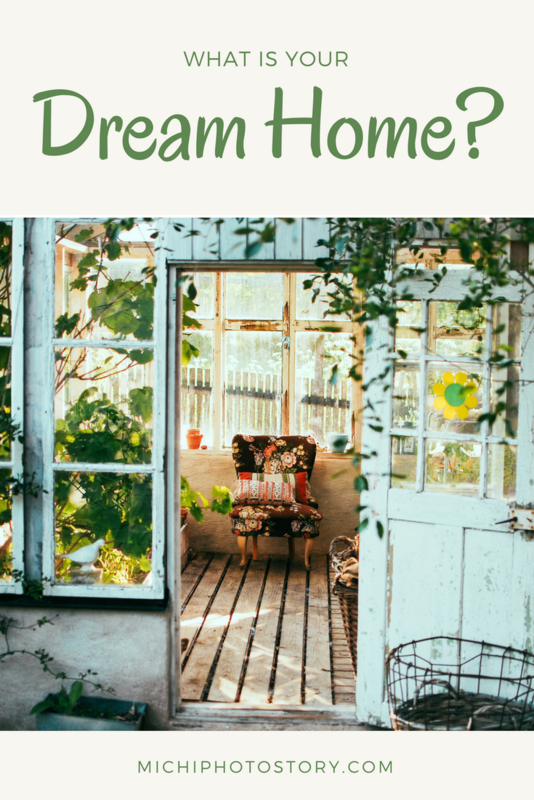 If you can book with the launch of a new season you’ll often secure early bird deals or helpful discounts such as free kids’ places, as well as the opportunity to spread the cost of your holiday and pay it off in installments. Failing that, if you’re looking for something departing soon you may benefit from a last-minute booking. Package holidays usually drop in price the closer you get to your departure date, so if you’re the impatient type this could be right up your street. Just be prepared to be flexible on your preferences as the later you book, the less availability you’re faced with - so you may have to alter your choice of resort, hotel, and even your departure airport. It will be worth it though and the more money you save now, the more you’ll have to play with when you arrive. Last week was really stressful because my son started his summer class so I have to adjust my schedule. It’s a struggle to wake him up and get him ready for school. His dawdling makes me so stress so every day I also adjust his wake up time so even he moves so slow, we won’t be late. I have to cook in advance so by the time we get home we have something to eat and of course I have to do some household chores. It is really obvious that full-time mom is not a bum. Well, I just want to stress that time is gold and every second, minute and hours are very important to me so please learn to respect other’s time. I will give some example that really pissed me off. Last Friday, we attended a debut, according to the invitation the party will start at 6PM but we already informed them that we will be late because my hubby will be coming from Makati, he’ll be out by 5PM. My son had his moments again, he doesn’t want to wear his clothes so we left the house with my naked son because we’re already late and dahil sa pagmamadali namin, I left my son’s shoes. We reached the venue 7:30PM, lo and behold we’re not late because the party will start at 8PM but it started 9PM and no dinner yet. OMG! I left my son’s shoes and we skipped dinner so we can be there as early as possible because my hubby was part of the 18 thousands (not familiar with 18k? minimum of 1k cash gift #brightidea but I’m not liking it). We did not finish the party because my son was sleeping already; we left at 11:45PM after the 18K program. I don’t really understand why you have to put 6PM when the party will start at 8PM. And last Sunday, it happened again. I was told that reunion will be at 11:30AM but everybody was late again. This was not the first time, it happened every year (reunion). The sad part is I don’t hear any apologies. Anyway, no matter what they say, I won’t bite it because it’s already a habit. I can still take 15 minutes late but more than 1 hour is not acceptable. I don’t really understand why you have to set a meeting time when you cannot commit. Now, whenever I see an invitation I’m really thinking twice whether I should be on time or not because this happened several times, two more scenarios. 1. Christening at 8:30AM, I travel from Laguna to Bulacan just to be there at 8:30AM, only to find out that baptism starts at 11AM. 2. 1st Birthday party at 1PM, I travel from Cavite to Q.C., arrived at 12:30NN and Jollibee staff told me na 2PM pa daw yung party. Not all people follow Filipino time, you are just punishing early bird guests. I admit that there are times that I’m late too but I really have a valid excuse and traffic is not included. I see to it that I inform the other party if I’m running late. Every day we only have 24 hours and we need to use it wisely. Please respect other’s time. We had a reunion last weekend, I suggested Sambokojin but they wanted Dads, Saisaki and Kamayan so I gave in. Meeting time is 11:30 and I was there 11:45am, it was really my plan not to be on time because my friends are always late and as expected they came past 12:30nn. They suggested the venue and time but they did not make any reservation so I was really disappointed, because I thought there’s already a reservation since it’s weekend. So imagine our waiting time just to be seated. We left the house at 9:30am so we’re really hungry. When my friends came, I asked one of my friends why she did not make any reservation and she said, “Busy ako noh, bakit hindi ikaw? wala ka naman ginagawa at nasa bahay ka lang buong araw”. I did not say a word because I choose my own battles but deep inside, I was deeply hurt, it is like a slap in my face that I’m very unproductive. Yes, I am a full-time mom but it doesn’t mean that I have so much free time. It doesn’t mean that I’m not doing anything. Full-time mom is also a busy individual, I’m not just watching tv, eating, sleeping or checking facebook, I have my own work too, it may not be in the corporate world but still, I work. I won’t resign from my part-time job if I have so much free time. I have neither Yaya nor helper and I’m doing my best to manage my time so I can finish my chores and just to have my own “me time”. If I was the one who organizes the reunion, I will definitely make a reservation even it’s a long distance call. So please, if you have a friend or you know someone who is a full-time mom, be careful with your words. 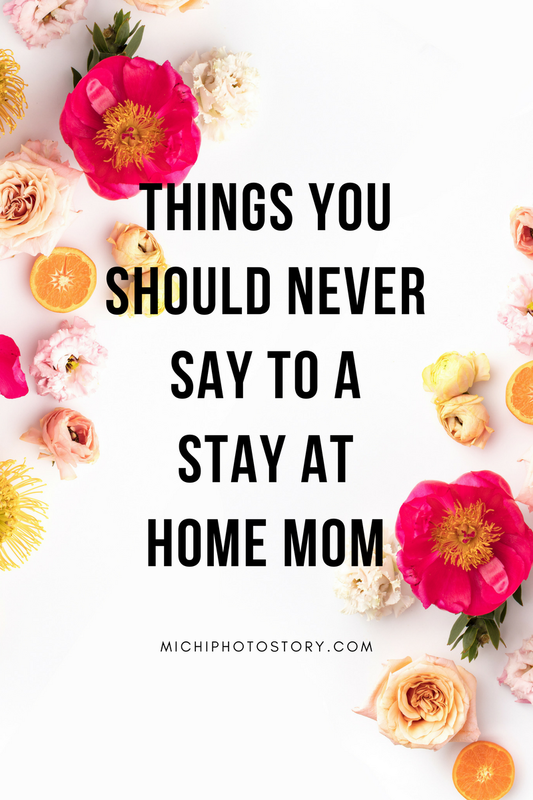 Here are some things you should never say to a stay at home mom: I’ve read this last month at Mommy Fleur’s blog. 1. When the kids are older, do you think you'll get a real job? 2. How June Cleaver of you! 3. Oh, so you don't work? 4. Since you have extra time on your hands, could you whip up a few dozen brownies for the bake sale tomorrow? 5. All day with your kids? I can't even imagine. 6. I'm jealous. I wish my husband were rich so I wouldn't have to work either. 7. What do you do all day, anyway? 8. I'm sure you're not the only one who's ever wasted money on a college degree. 9. That explains why your son is so clingy! "I can't wait for people who don't have kids to start having them so they can eat their words and opinions." As I mentioned before, this was really an unplanned trip, after our visit in Nagcarlan Underground Cemetery, I told my husband to go back to my grandmother house because I don’t think this is the best time to go to Taytay Falls. 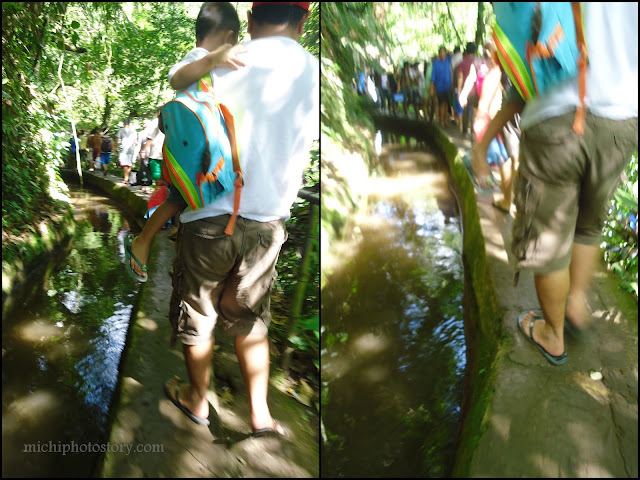 But he was really determined to swim so we continued our journey. 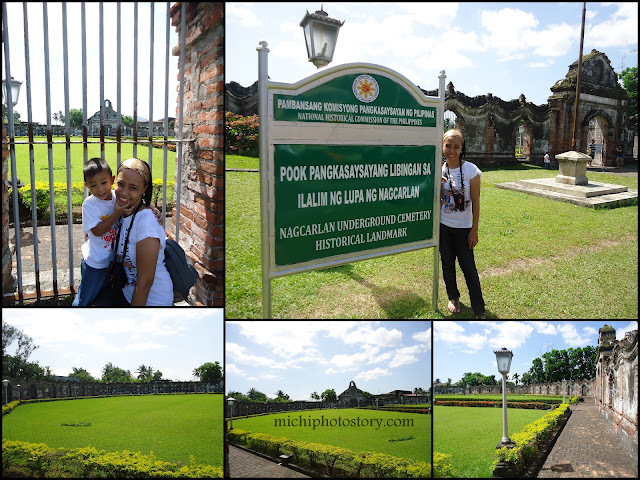 After 3 hours (almost) of traveling from Victoria, Laguna we reached our destination. We had 3 stop overs along the way; some people are asking for donation for fiesta daw, you have no choice but to give kasi naman hindi ka makakadaan at may harang talaga na tali. 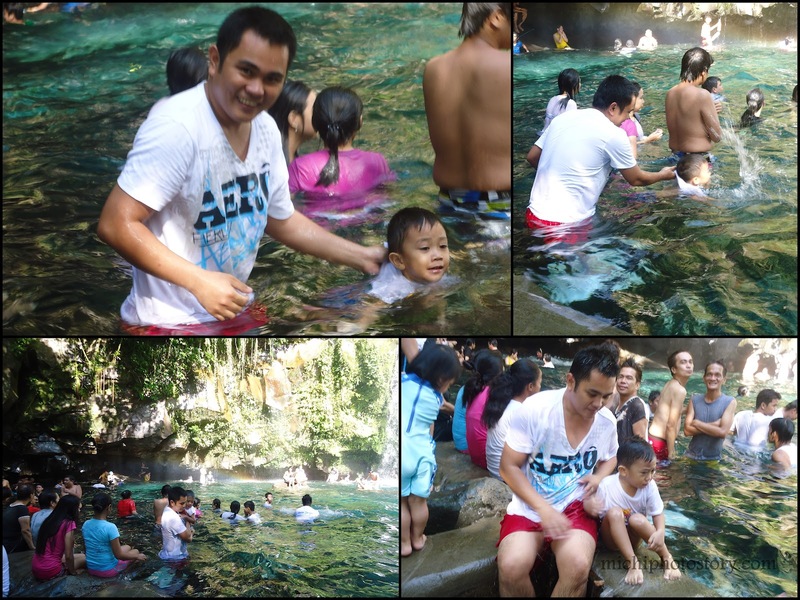 Entrance fee: P20 each no charge for my 3yrs old son. There is a logbook at the entrance, just write your name, pay the entrance fee and they will give you the stub. You have to bring the stub on your way to the falls; there is a guy who collects all the stubs. 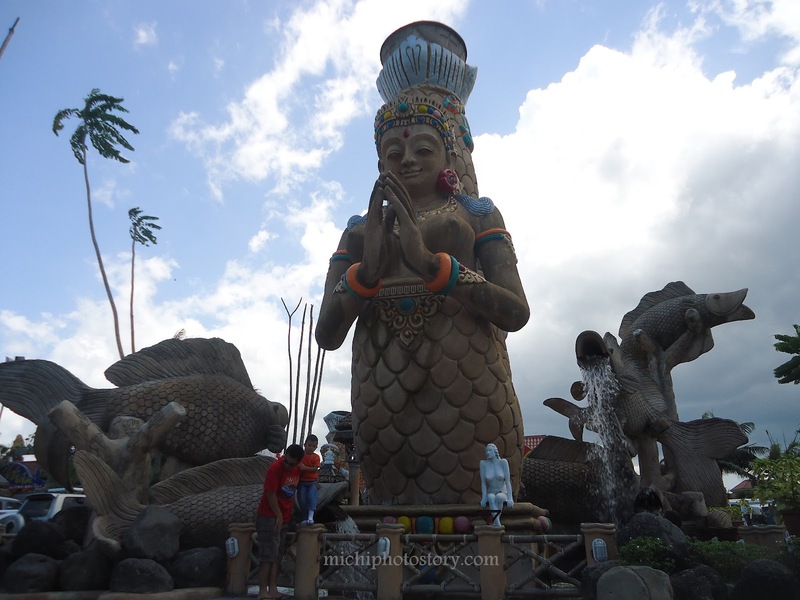 From the parking lot, you will pass few sari-sari store and carinderia where you can buy food and drinks. But it is best if you can bring your own food. 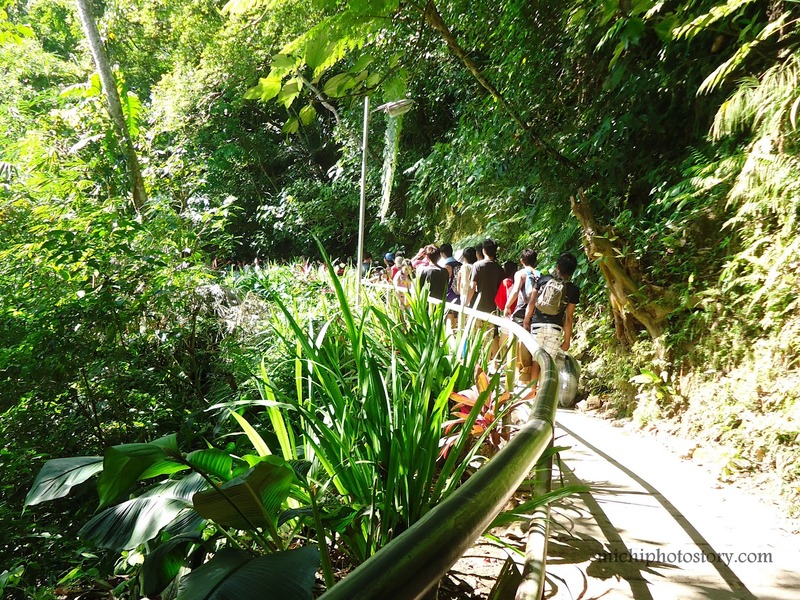 You need to walk about 15-20 minutes before you reach the falls, it depends on the traffic and how fast you walk. Traffic na, pababa pa lang! It was Black Saturday so the place was really crowded. 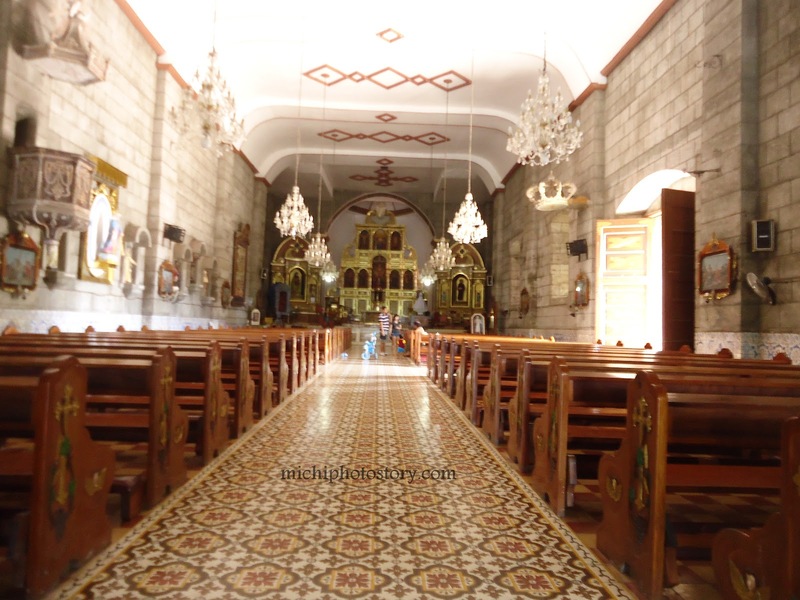 I don’t really plan any summer outing during Holy Week because I dislike traffic and crowded places. As far as I can remember, we only had one family outing during holy week. 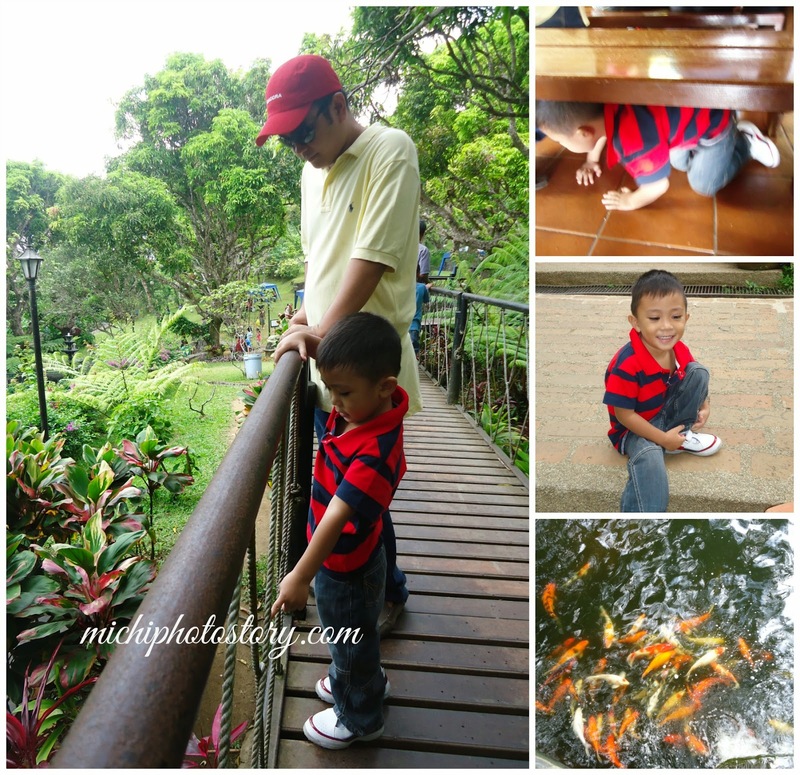 We had a day trip in Golden Sunset and it was my hubby’s decision. 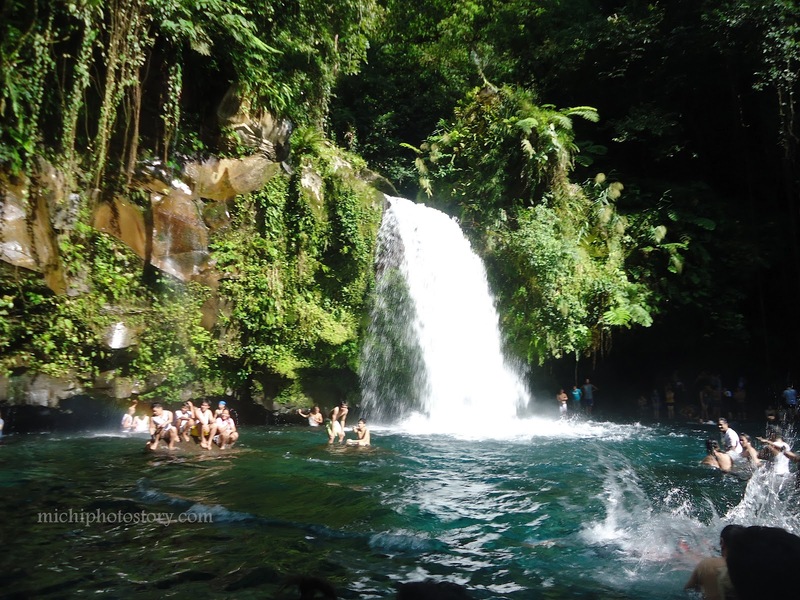 Anyway, Taytay falls is just a small falls compared to Daranak Falls, Three Falls, Mt. Pico de Loro Falls, Katibawasan Falls and Kawasan Falls. So far, this is the 6th falls that I’ve seen. 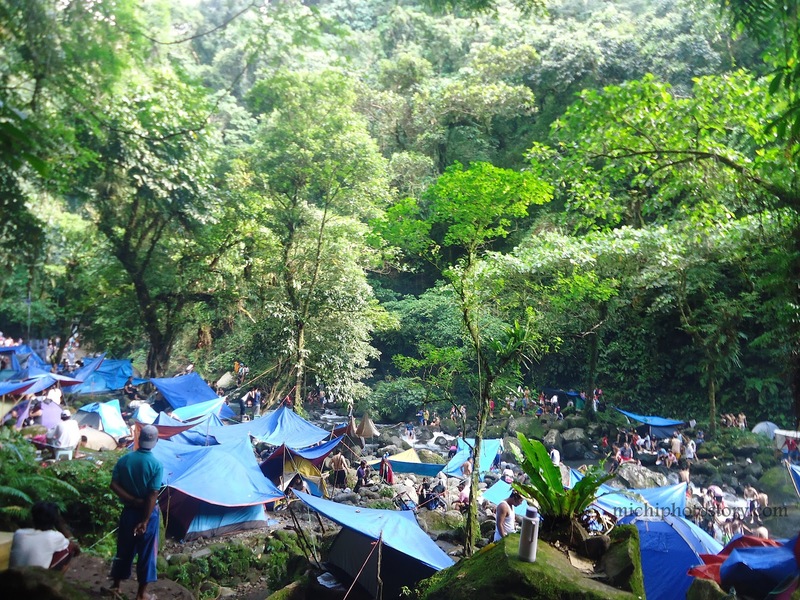 Ten or eleven years ago, I was supposed to be here but I did not join the trip when I learned that most of the participants were boys and it was an overnight trip. I don’t see myself sleeping in a tent and I’m not sure if there’s a comfort room in the area. But if I joined the trip, this will be our first meeting (hubby and I). He was one of the participants and according to him "maganda daw ito and nagtrek talaga sila mula baba. Akalain mo pwede naman pala magkotse, nagpakahirap pa sila. Hehe! Sayang daw, sana daw sumama na ko nun kasi ang laki daw ng pinagbago ng falls kasi ngayon commercialized na." 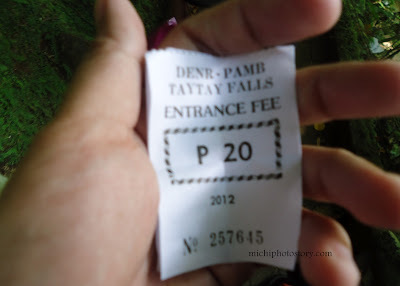 I must agree with him because I did not enjoy our Taytay Falls trip. The place was really packed; there were tents and trashes everywhere. I had a hard time looking for a good spot where I can stand and take pictures. 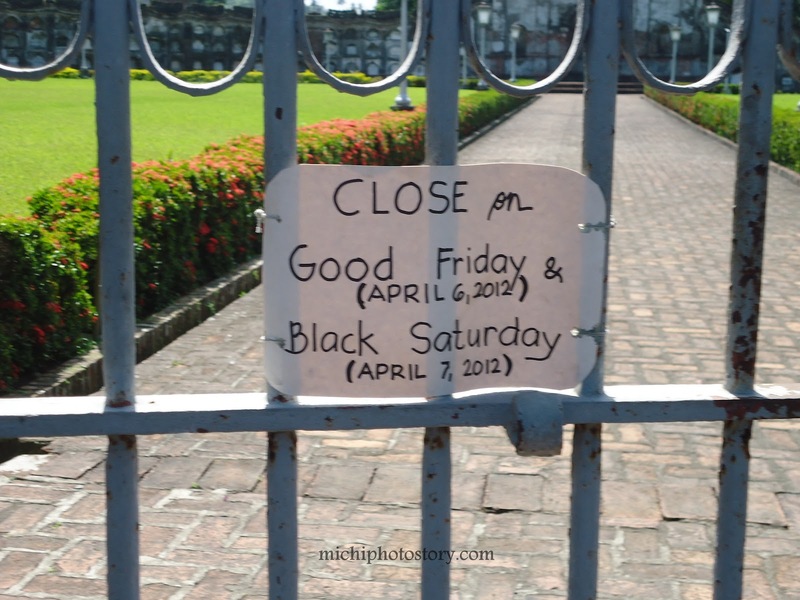 I don’t know if this is the scenario every weekend or dahil holy week kami nagpunta. We only stayed for one hour including our walk from parking to falls and back to parking. 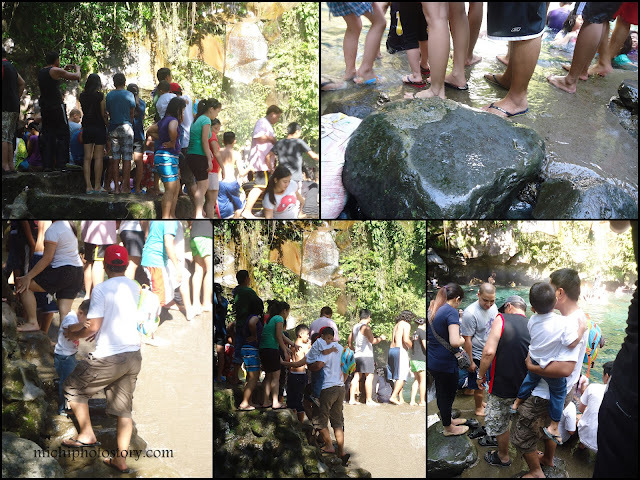 I felt sad when I saw the falls, sana lang malagaan nila. 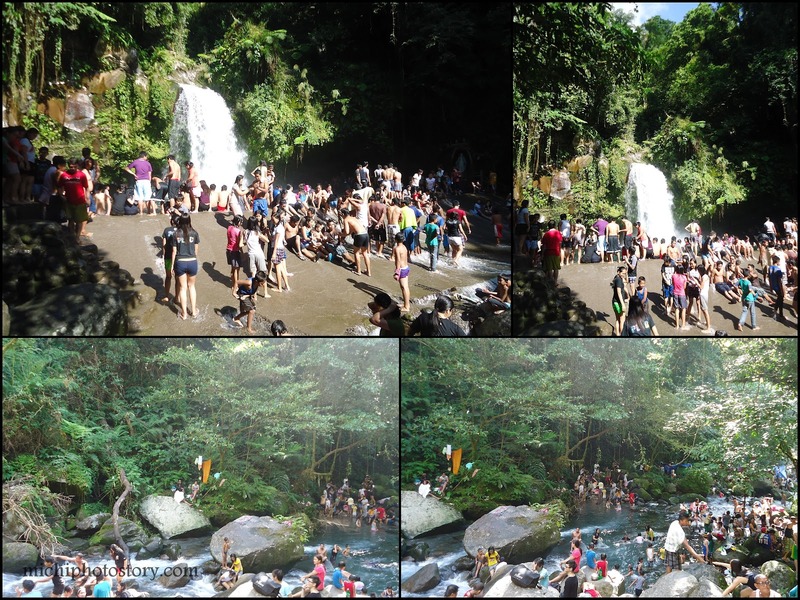 From Taytay falls back to Victoria, Laguna, we travelled 1 hour and 30 minutes (wala ng side trip). 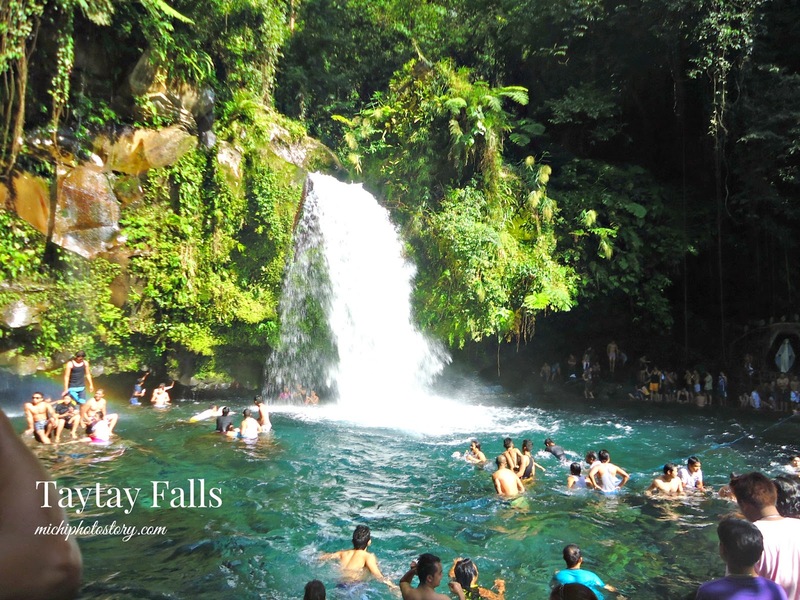 Note: Taytay falls is also known as Majayjay Falls or Imelda Falls. There is shower room and comfort room in the area but I have no idea if it is clean. 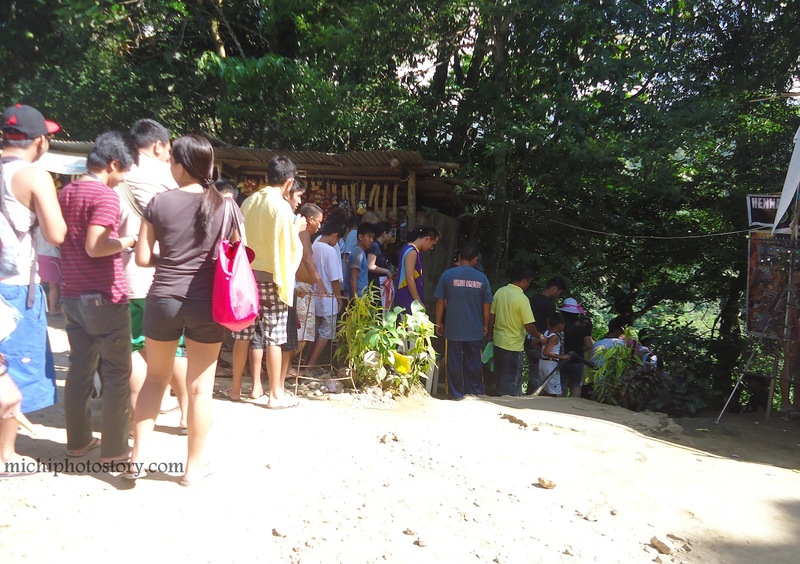 Hubby and son did not take a shower after they swim because of the long line. Good thing that we are less than 2 hours away from my grandmother’s house. 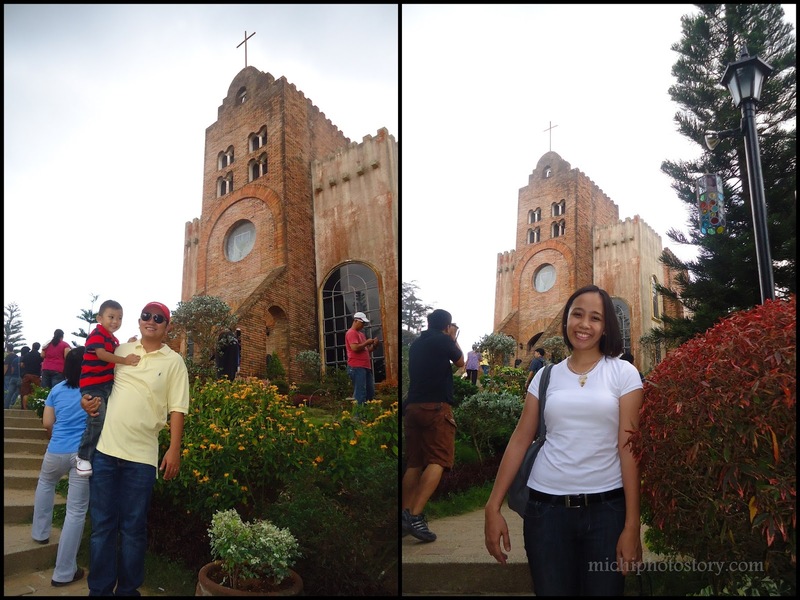 Since 2008 we always visit Caleruega, this is my husband tradition or some sort of “panata”. 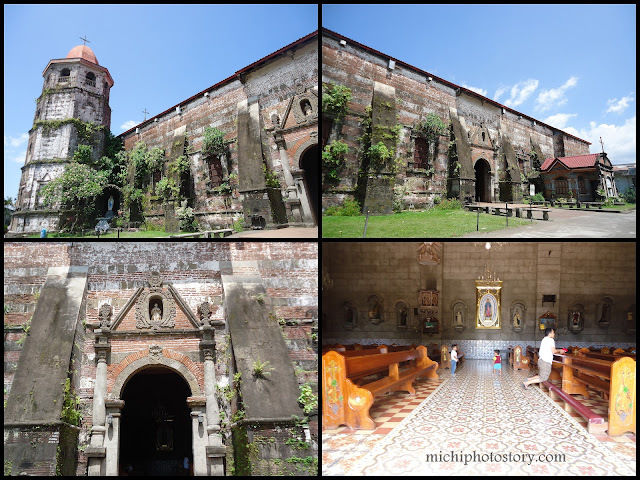 Last Friday, we went to Caleruega before going to my grandmother’s house, we left early to avoid traffic. You can never get tired of this place; it is very relaxing and refreshing place so it is not surprising anymore if couples want this as their wedding venue, schools choose this for their retreat and people love to visit this during holy week. We are one of those people who visit Caleruega every Holy Week. This is my son’s happy place. 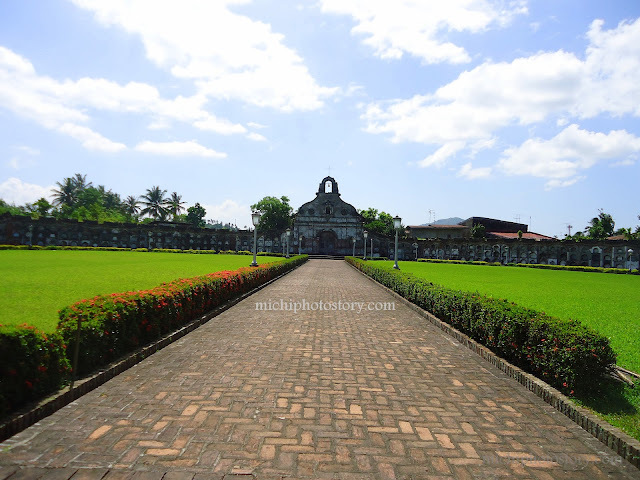 Caleruega was named after the birthplace of St. Dominic de Guzman, father of Order of Preachers. Wishing to honor and remember the legacy of their founder, he Filipino Dominicans established Caleruega with the hopes that it will, like the town of Caleruega in Spain, be a birthplace - a genesis for people speaking to and for the Divine Creator. 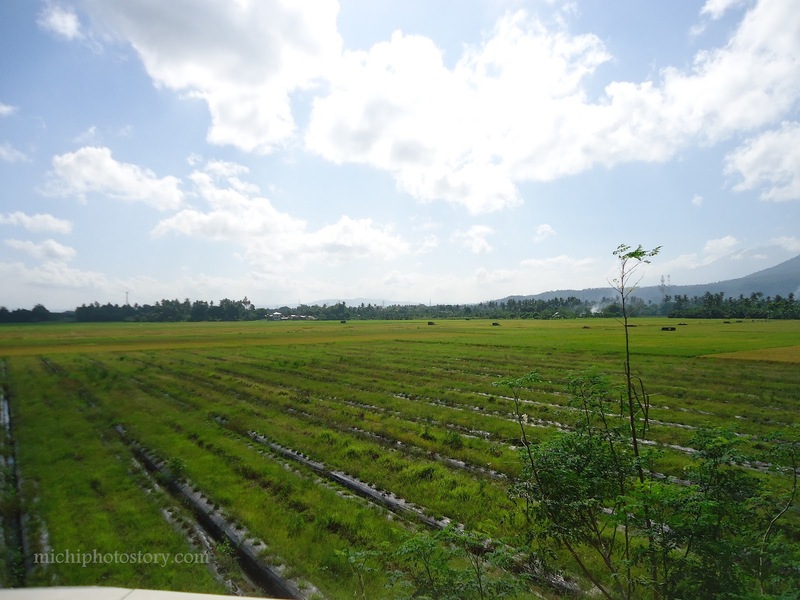 Silence, solitude, harmony, the majesty of creation, the freedom of Light and the passion to share God's word - this is Caleruega: the seedbed of preachers, the cornerstone of spiritual inspiration. Come, walk in His presence. 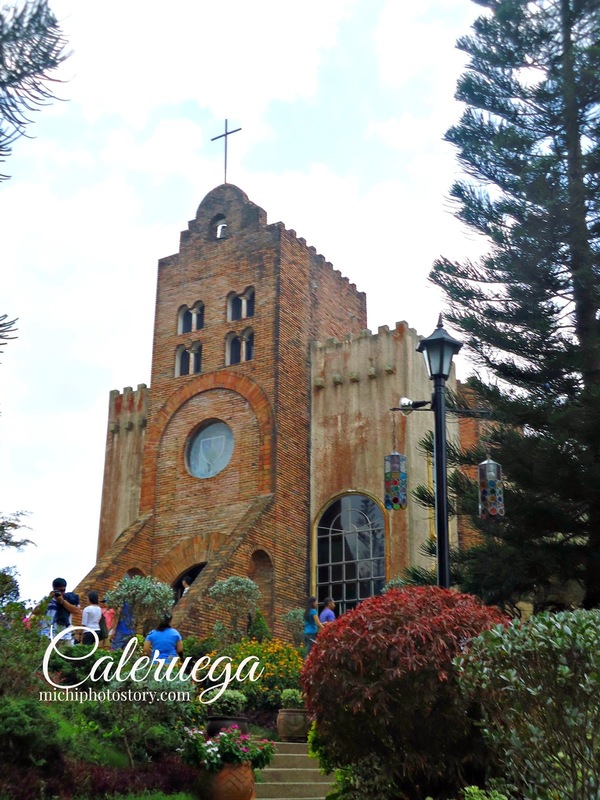 Caleruega celebrates the priceless gift of life and its Giver. Here, the lost soul finds direction; the weary traveller is shown the Way. every tree, flower and brick is a testament to God's splendor and power. 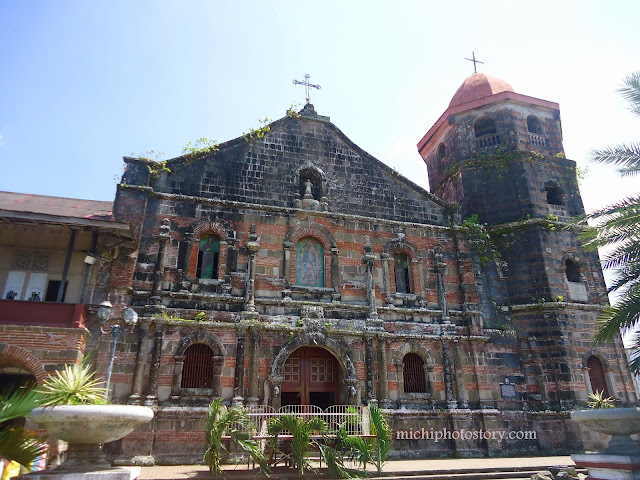 Caleruega speaks through signs and symbols. It is a haven, a home, a sanctuary amidst the beauty of nature where pilgrims are open to prayer, to creative transformation, and to Gospel values. 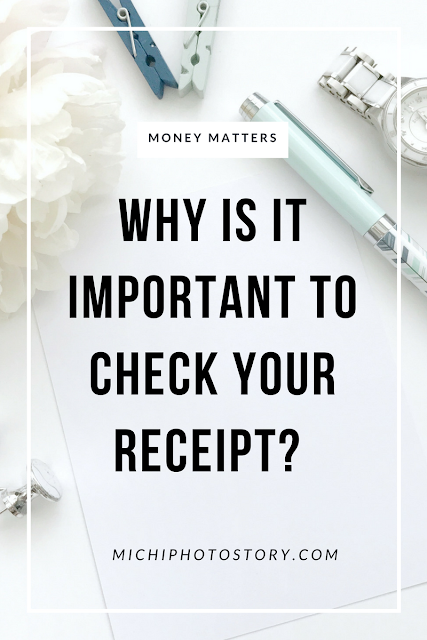 Do you always check your receipt whenever you buy something? Do you really examine the amount printed on the receipt? Or you don’t care at all. If you’ll ask me, I always check my receipt but there is one instance that I did not check my receipt after I purchased some items. When I got home and checked my receipt, I found out that the “buy 1 take 1 item” that I purchased was not charged as B1T1 so I bought the items at regular price. I was so disappointed because I only bought the “Little Einstein” CD because its buy 1 take 1 for P120 or P150. But I did not go back to Festival Mall because going there is more expensive (gas, tollgate and parking) compared to P120 or P150 that I overpaid. I can easily notice this if I only bought the cd. So lesson learned, don't forget to check your receipt. pero napagpalit ng cashier yung amount. Good thing that I checked my receipt before I left the counter, I informed the cashier about it and she made some adjustments. Then yesterday, I went to SM to buy some personal stuff, I saw some Buy 1 Take 1 shirt for my son so I bought two sets of B1T1. I checked the monitor screen to ensure that I really get the discount then I noticed that the B1T1 item was charged as regular item. I called the attention of the cashier. Cashier: Ma’m pag natotal na po natin saka po makikita yung discount. So I paid the items and she showed me the receipt, “ma’m ito po o, may 50% off na”. I said ok and left the counter. While walking I’m still checking my receipt and I was right, I paid the B1T1 items for regular price of P199.75 each so I overpaid P199.75. I went back to the counter and told the cashier about it but she insisted na nagreflect yung B1T1. I told her that I have two B1T1 items and I only see one discounted price. Good thing that the supervisor was there and she checked my receipt; they unwrapped my stuff and checked the items. And the supervisor said sorry for the inconvenience, they called someone to inform about the error. One guy came and he said, he will just issue DRA (not sure sa term). I waited again, the guy came back and gave the cashier a slip but the cashier needs a code but no one can give her the right code. I’ve been waiting for more than 40 minutes and you know that I hate waiting so I asked the cashier if I could just cancel the B1T1 item and replace the items worth P399.50. I used my credit card so there’s no way that she could give me the amount in cash. I know that she can call the credit card company to cancel the amount and re-enter my purchase but I don’t want to wait anymore. So I get 1 queen pillow and 2 pcs of M&M and pay the difference. 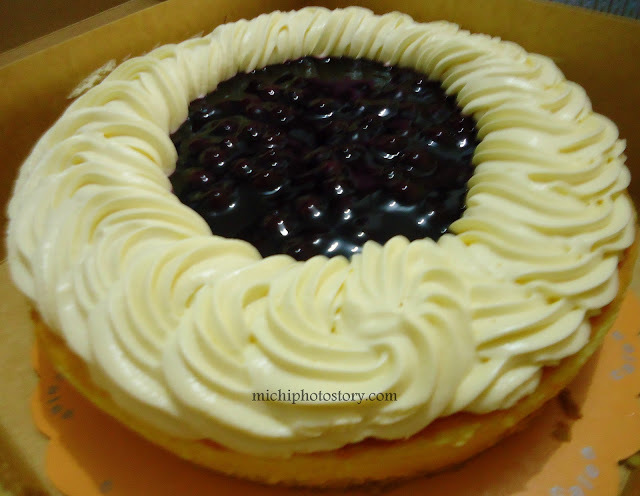 Hubby came home last Friday from Cebu and Bacolod trip, last stop is Bacolod so I was really happy because I can taste again my favorite Calea blueberry cheesecake. 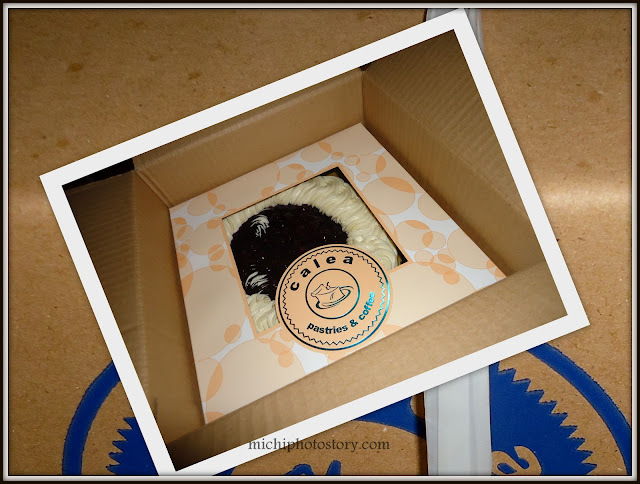 I told you before that Calea is just in front of L’Fisher Hotel and hubby stayed in this hotel so he has no reason for not buying this cake. One whole cake is good for 12 slices, P715 + P35 (pasalubong box). And as of this writing, I still have one slice left.